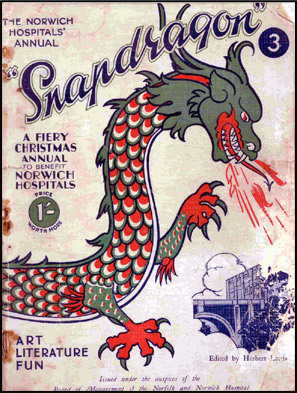 Snapdragon Magazine was the Norwich Hospitals Annual which was issued under the auspices of the Board of Management of the Norfolk and Norwich Hospital. This magazine is a Christmas 'special' issued in 1932 at a price of one shilling. The magazine features art, literature, and fun alongside written accounts of life on the wards and advertisements for local business.